Last night, I found the note from Marion Alderman. It is handwritten, on an old piece of notebook paper. For ages, I kept it folded in my wallet until I feared the paper would disintegrate. A few years ago, I put it in a box with some other notes and letters I hang onto, all precious things. Marion died last week, at 92. I knew her from Syracuse, her hometown, where her family ran a place called Morey’s Cider Mill. As a young woman, Marion learned she had tuberculosis. The doctors removed one of her lungs. She spent years in a sanitorium, an experience that helped build the steel will I grew to love, many years later. It all relates to the lesson she reinforced about my business, the reason why I kept the note. To me, it is a talisman of what matters about journalism, a reminder that the key to the greatest stories almost always depends – in some way and at some point – upon the trust, decency and vision of the people who should always be at the center of our jobs. The note arrived more than 20 years ago, when I was working at the Syracuse Post-Standard, not long after my editors asked me to travel to Scotland. It was 1998, and we were a few weeks away from the 10th anniversary of the terrorist bombing of Pan Am Flight 103. The plane exploded far above the village of Lockerbie, and the fuselage fell to earth with the violence of a fire bomb. All 259 crew and passengers were killed. Eleven people died on the ground. Among the lost were 35 students from Syracuse University and five others with close ties to that upstate region. The list included Paula and Glenn Bouckley, Marion’s daughter and son-in-law. The couple had a beautiful, you-can’t-make-this-up love story. Glenn was from Great Britain. He and Paula were devoted fans of the rock group Queen, and they became pen pals through a rock music newsletter. Their correspondence led to an eventual meeting, and the meeting to a romance and a marriage. Glenn and Paula settled in upstate New York. On Dec. 21, 1988, they were flying home from attending the marriage of Glenn's brother, in England, where Glenn served as best man. They were planning to host Christmas dinner for the first time for Marion and Paula's three sisters, Martha, Laura and Lisa. The plane never arrived. Marion was left with a loss impossible to fathom. It took her eight months before she could will herself to travel to Scotland for the first time. A police investigator who soon became a friend led Marion and Laura to the place in the fields where Paula fell, a place where Marion eventually hired a carpenter to raise a wooden cross. The townspeople, in her absence, always tended to that spot. It helps explain why Marion, a widow, fell in love with Lockerbie, a village that embraced her on every visit. When she married her second husband, Ed Jablonski, she married him there, in an old church. At one point she hosted four high school exchange students at her home near Syracuse, including one from Lockerbie. Marion understood the mystery of the place, the way the scene of an unspeakable crime became a refuge where the families of the lost somehow found comfort. In the end, she once said, it came down to a simple truth. In Lockerbie, she felt Paula's presence. My assignment, in going to Scotland with photographer Dennis Nett, was to try and channel that connection into words. I had colleagues in the newsroom who warned it might be impossible. They had been to Lockerbie. The village, they said, was tight-knit and intensely protective of families wounded by the disaster; many people remained upset about some experiences with the media. There was a chance we would travel there and be turned away as intrusive, as outsiders. With that in mind, I did everything I could to try and build a bridge. 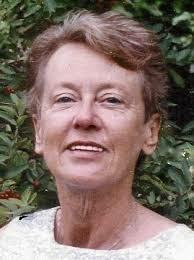 I called Pat Brunner, of Hamburg, whose daughter Colleen had been on the plane. 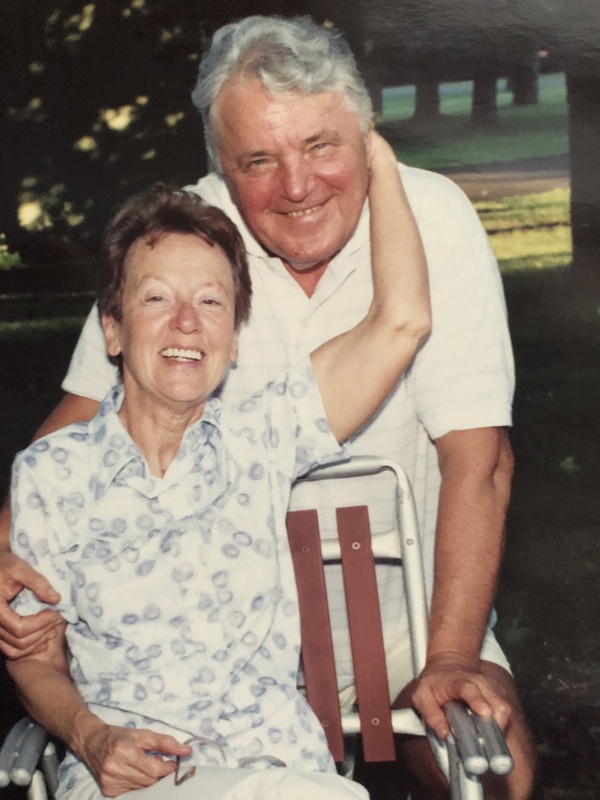 Pat, who died in 2004, told me stories about her own deep connections with the townspeople, and she provided contacts that turned out to be of tremendous help. We also went to see Marion, whom I had met years earlier. She sat in her living room and tried to explain what she felt in Lockerbie. At the time, her daughter Lisa worked for an airline. Marion could travel free by air, and she often used that opportunity to go to Scotland. She gave us suggestions on where to eat and where to stay, and she spoke with love of the people who greeted her as family. In describing the village, she grew more and more wistful. She had recently returned from a visit, and she kept telling us she wished she could be there to help us find our way. We thanked her. We told her she had done far more than we could hope. Still, I remained a little nervous about the trip, uncertain about how we would be received. Not long before we left I received an envelope in the mail. I opened it up. 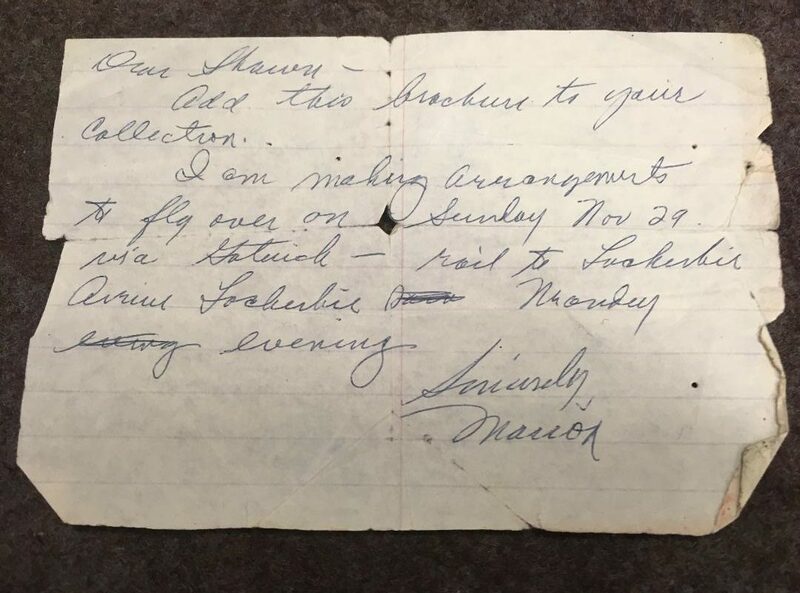 Handwritten, on green-lined paper, was the note from Marion. She had made a spontaneous decision to fly across the ocean and meet us there. It changed everything. We stayed in the same inn as Marion, a place operated by a woman named Ann Wilson, and we laid out our plans each morning over breakfast. Everywhere Marion went, she opened doors for us. People who had witnessed things that went beyond description greeted her, then let us into their warm kitchens because she said it was all right. Even in a raw and rainy December, the village seemed to give her astounding energy. As we walked muddy trails, Marion led the way. On the one day off we had amid our work, I made plans to drive to Buckie, a little city on the North Sea many hours away. My mother’s parents and siblings, immigrants to Buffalo, were born in that community. I knew it might be my only chance to see the place. Marion rode with me. She was an eternal mother, and she worried about me making the long drive alone. We came home and did our stories, tales of grief and bravery that stay with me today. I knew none of it would have happened without Marion, which is why I kept her note in my wallet. She understood what we would find in Lockerbie, and she wanted the story told correctly. Once we were home, she waved off our thanks. Dennis and I would see her now and again over the years, seemingly unchanged in appearance or resilience. If Marion was right about a sense of presence, I expect she has found her way to peace in Lockerbie. Sean Kirst is a columnist for The Buffalo News. Email him at skirst@buffnews.com or read more of his work in this archive.